Are you people feeling dam bore of referring several sites about Madhya Pradesh GK Quiz? Well don’t be concerned, we are here with you to help you out. This post provides you the Madhya Pradesh GK Questions through which the aspirants who are preparing for their exams can easily take the Madhya Pradesh Online Test provided in this post. This post is really useful for the candidates who are preparing for their competitive exams. The candidates need to get brushed up with various concepts for facing their exams. So, our site helps you out to meet and get prepared yourself within a short span of time. Madhya Pradesh Online Test provided in this post helps the candidates to face their exam in a non-risky manner. This gives you the complete details of Madhya Pradesh by providing each concept. This enables you to be stressfree in meeting the reviews. 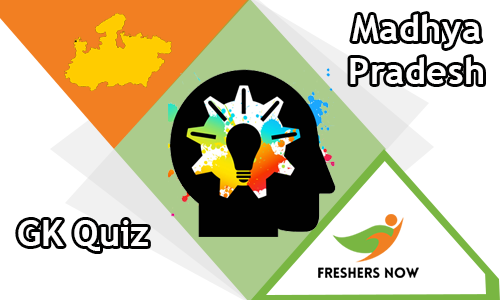 The Madhya Pradesh GK Quiz provided in this site contains 25 questions with a time provided for 30 minutes. The candidates need to answer the questions within the time period that is provided. The Results are purely based on the responses that you have given during the exam. So, candidates can rectify your mistakes and get shine for competitive exams. 1. The famous ‘Kalidas samman’ from Madhya Pradesh Government is not given in which of the following fields? 2. ‘Dada Dhuniwale Thermal Power Plant’ is projected in which district of Madhya Pradesh? 3. Which place in Madhya Pradesh is known for ‘Festival of Dances’? 4. Who among the following is the author of ‘Kaisa Chhand Banaa Deti hai’? 5. Who was Madhya Pradesh’s chief minister in 1984? 6. Indian Institute of Science Education and Research is located at which place of Madhya Pradesh? 8. ‘Madikheda Dam’ is built on which river of Madhya Pradesh? 9. Name of Bhopal Airport? 10. ‘Hardula ki Manuti’ is a folk song of which region in Madhya Pradesh? 11. Which place of Madhya Pradesh is called ‘Detroit of Madhya Pradesh’? 12. The ‘Bharthari folk song’ is mainly sung in which region of Madhya Pradesh? 13. Mausoleum of ‘Mian Tansen’ is situated in which place of Madhya Pradesh? 15. How many stations of ‘All India Radio’ are present in Madhya Pradesh? 16. ‘Gwalior Gharana’ is one of the oldest Gharana based on which form of Hindustani classical music? 20. In which year the Bhopal gas tragedy occur? 21. How much is the total area (sq km) of Madhya Pradesh? 22. Which of the districts in Madhya Pradesh has the lowest area? 23. How many districts are in Madhya Pradesh, in the present? 24. Madhya Pradesh's two largest districts are from Konya by the presence of area? 25. Which hills of Madhya Pradesh is known as ‘Queen of Satpuras’? Moreover, this site provides you the Madhya Pradesh GK Questions and Answers so that the candidate can polish themselves by redressing their mistakes. By Madhya Pradesh General Knowledge Questions and Answers, the aspirants can get the detail explanation of each question. So, aspirants, don’t are late to undergo the Madhya Pradesh GK Quiz and keep on visiting our site Freshersnow.com. Madhya Pradesh is the state of India. Madhya Pradesh came from the word Madhya which means “central” and Pradesh means “region.” The state has no coastline and no international frontier. Soils of Madhya Pradesh are classified into two major groups. Fertile black soils which are found in the Malwa Plateau and Narmada valley. Less-fertile red-to-yellow soils are spread much in eastern Madhya Pradesh. The average rainfall is about 44 inches. Most of the parts in Madhya Pradesh receive almost all the precipitation in the monsoon months. The forest areas include the Vindhya Range, Kaimur Hills, Satpura and Maikala ranges. The forests include large mammals such as tigers, panthers and bears. Hindi is official state language. The second important language is Marathi, Urdu, Oriya, Gujarati, and Punjabi. Within the stipulated time provided candidate can know their performance. This Madhya Pradesh GK Quiz will be like pre-assessment for the candidates facing the competitive exams. Everyone knows that at the time of taking the Madhya Pradesh GK Quiz the time management is very important. So, within the showing time complete Madhya Pradesh Online Test. At the end of the exam, candidates get their results. According to the results obtained the candidates can know their performance. For Furthermore details and updates, keep on visiting our website Freshersnow.com.